View more documents from homespicedecor. Custom and special size orders are available in our cotton braid, wool braid and Ultra-Durable lines only. A 50% deposit via credit card is due when the order is placed. The remaining 50% is due when your order ships. There is a 4-6 week lead time for custom and special size rugs orders with final destination in the U.S. For custom and special size orders with final destination outside the U.S., the lead time is 12-16 weeks. When ordering, please note desired shape (rectangle, round, oval or square. View custom order worksheet. To place your order or get more information, call us 770-934-4224 or email us at sales@homespicedecor.com. For more information about opening your Homespice Decor account, call us at 770-934-4224 or email us at sales@homespicedecor.com. E N R I C H.
E – ETHICS. When you buy a Homespice rug, you’re buying from a family-owned business that guarantees your 100% satisfaction. Our rugs are manufactured ethically in comfortable, safe facilities, with the utmost attention to care and quality. We believe in our work so deeply that each of us at Homespice has at least one of our rugs in our own homes. N – NATURAL FIT. Homespice Décor rugs are a natural fit for any room as each rug is so colorful. From entry hall to living room and outdoor living spaces, you can create a symphony of color that showcases your own unique identity and lifestyle. R – REAL. Although it’s one of the most attractive braided rugs in the world, our product is more than a stylish statement. We offer beautiful and practical choices for outdoors, indoors and wet areas, even in hard-to-fit sizes. I – INNOVATION. We invented the rectangular braided rug. We’re a trend setter in adapting traditional American rug techniques to modern sensibilities. In fact, we’re so committed to braiding innovation that in 1998, we hired a PhD in Braiding who had just worked with NASA on the Mission to Mars program. C – COLOR. Our design team constantly travels the globe to research new trends and color palettes. Our dyes and color selections are always fresh and rich, making us unparalled to the rest. H – HERITAGE. Homespice Décor’s textile history goes back four generations. Starting from desert traders in old Indian cities, this rug now comes to you from the history of our tradition. We are proud to offer the braided rug to you, a fusion of innovation, color and heritage. Spills should be cleaned as soon as possible. Spot cleaning with a non-bleach detergent is fine. For deep cleaning, we recommend seeking a professional dry cleaner. 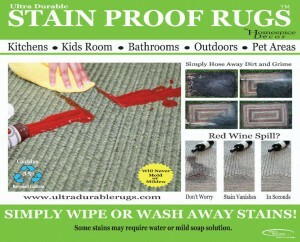 Our Ultra-Durable rug line is stain resistant and can be cleaned by simply hosing them down. However, the rug must remain flat to dry. 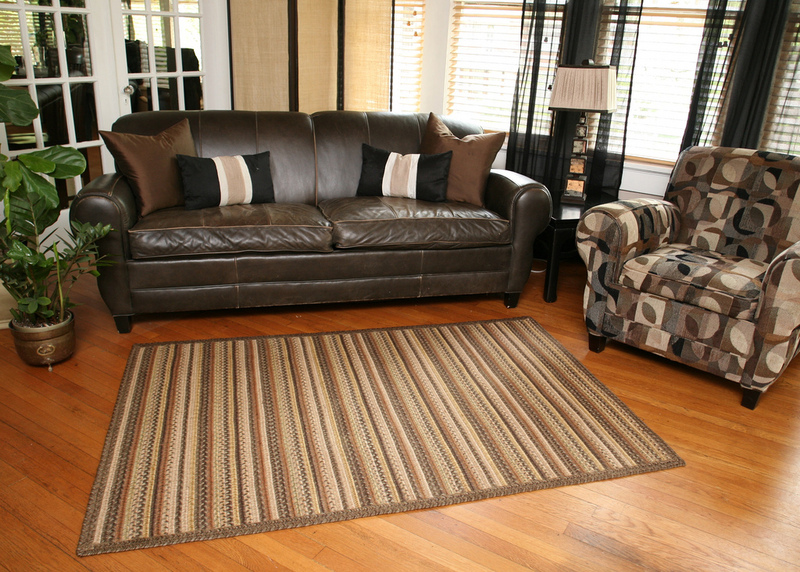 When cleaning any of our rugs, please let the rug lay flat and flip it to allow the rug to fully dry on both side. When you need to clean the whole rug, we recommend using professional rug cleaning service. Do not dry clean. We recommend professional rug cleaning. Do not wash at home in a clothes washer. To protect your investment, use a rug pad. A rug pad provides traction between the rug and floor to prevent slipping. It adds padding and keeps the rug smooth and flat. Extending the life of the rug, a pad protects the backing and prevents any possible color transfer. All of our rugs lay flat when they leave the factory. When the rug is new, let it flatten out naturally before use. Work out any wrinkles using your hands or a cylinder (the actual carpet tube works well, too). Natural fiber, and even many man-made fibers, will fade after enough exposure to sunlight, heat, humidity and oxides. Extend the life of your rug by rotating and flipping several times a year, especially if all or any part of the rug will be in direct sunlight for hours at a time each day. 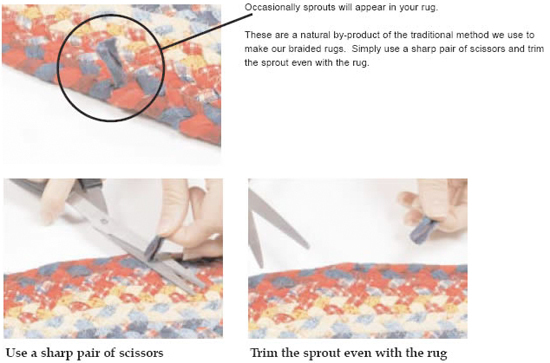 Braided rugs are stitched together using extra strong thread. Should the threads become damaged or cut, the braids may start to separate. We recommend sewing the braids back together with a needle and thread immediately. If left unattended, this separation will certainly grow. How are rugs cleaned if there is a spill? Spot clean the rug using a mild non-chlorine detergent and water. Soda water is even better than using water. We used Tide (not “Tide with bleach”) in our experiments, mixed in with water and it cleaned away most stains satisfactorily. Cleaning immediately after the spill is important. The longer the stain is left on the rug, the harder it will be to clean. View our videos on spot cleaning rugs here. What about an overall cleaning? Should I get the rugs Dry Cleaned or Professionally Cleaned? Overall cleaning is necessary every so often. However, DO NOT dry clean the rugs. Take them to a professional rug cleaner and get them “Professionally Cleaned”. In Dry Cleaning they put the rug in the dry cleaning machine with dry cleaning fluid which is damaging to the rug. Sometimes people put a small size rug in the washing machine. That is NOT recommended. Unlike clothes, rugs cannot be ironed back to a crisp flat shape and they get a little “bent” after being in the washing machine. Are pads needed for the rugs? 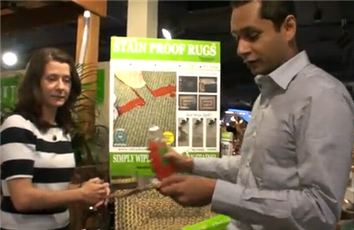 Rug pads will prevent accidents and people from slipping and falling. It also gives the rug more stability which will preserve the rug longer. What about fading? Are the rugs colorfast? All textile products (such as shirts, jeans etc) are susceptible to fading over time. It is inherent to all textile products. Our rugs are high quality and amongst the best you can buy. Our Ultra-Durable rugs stand up well to fading as they are designed for both indoor and outdoor use. However, no rug is completely impervious to fading. We recommend that you rotate and flip your rug several times a year to help even its exposure to both indoor and outdoor light and to extend the life of the rug. All colored textiles are subject to bleeding in a small amount of the dyes used in the manufacturing process. Darker colors are more prone to this. We recommend that your Homespice rugs be cleaned by a professional rug cleaner and never laundered in a washing machine or through dry cleaning. We strongly recommend using a rug pad under the rugs so if you spill a large quantity of liquid on your rug, there will be less chance of any color transfer to carpet or flooring under the rug. What is Homespice Décor’s Warranty? Click here to view our updated warranty, effective September 1, 2011. What are the differences between the cotton braids, Ultra-DurableTM and the wool braids? Cotton braids are a flat braid which makes it easier to slide furniture on it. They are our signature braid. They are extremely vibrant and colorful. They are not as traditional as the Wool braid. Ultra-Durable braids are our “performance” braids. They don’t stain, mold or mildew. They can go indoors or outdoors. They are made out of man-made fibers (Olefin). Wool braids are made from wool yarns. They are the most traditional of braids. How will I know if something is in stock? If not in stock, generally how long does it take to be back in stock? We try to keep everything in stock. If not in stock ,we usually have it within 8 weeks. Retailers can check stock status through the links in the upper right corner of any page on our website or calling in to our office during office hours (9am – 5:30pm ET, M – F). 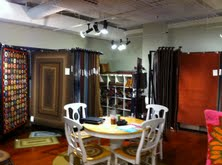 With a great new line-up of fall products, we're having fun at our Atlanta Showroom in Bldg 1, Showroom 10-D-7. New holiday-themed hook accessories for Halloween and Christmas are sure to please and give you unique choices for your customer. Stay tuned for new video from our showroom. In the meantime, watch videos from our Atlanta Showroom during the January 2011 Atlanta Gift Show. 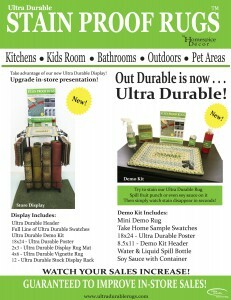 Jump start your Ultra-Durable Rug sales with our new display podium. Small vertical footprint holds stock and let's your customers see for themselves that stains and spills are no match for this magic rug. Comes complete sets of our solid and multi-color patterns and our amazing demo kit fits in at exactly the right height to allow customers to try to stain an Ultra-Durable test rug with soy sauce, Kool-Aid and other dreaded stain-makers. Click here to view photo of complete podium and details of what's included.